There is one post filed in philippe. 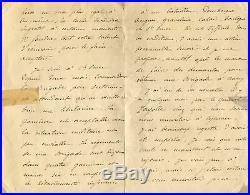 Autograph letter signed, 3 1/2 pages – on two adjoining sheets (both sides), 5,25 x 8,25 inch, St-Omer, 12.06.1912, `4. Brigade D`Infanterie` letterhead, in French, to “mon general” – concerning the 3rd volume of Marshal Ney and the situation of his brigade in St-Omer, written and signed in dark ink Ph. 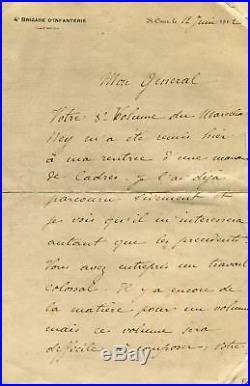 Petain, with browning, creases and tears to the corners, and intersecting letter folds with tears to the edges (partly taped) and the paper interfaces – in fine to good condition. Accompanied by a printed letter with facsimile signature. In parts: Votre 3e Volume du Marechal Ney m`a ete remis hier a ma rentree d`une manouvre de Cadres. Je l`ai deja parcouru vivement et je vois qu`il m`interessera autant que les precedents. Vous avez entrepris un travail colossal… Je suis a St-Omer depuis deux mois, commandant la Brigade par interim et attendant qu`on veuille bien me titulariser. La garnison est acceptable, mais la situation militaire est peu enviable. Les regiments de ma Brigade sont disperses dans quatre garnisons… Il va essayer de changer son affectation pour Nancy; il a eu des nouvelles du general Fayolle… Translated: I received the 3rd volume of Marshal Ney yesterday after my return of a manoeuvre of squads. I have quickly overlooked it and I see that it will interest me as much as the previous ones. You have undertaken a colossal work… I have been in St-Omer for two months, commanding the Interim Brigade and waiting to be engaged. The garrison is acceptable, but the military situation is unenviable. The regiments of my Brigade are scattered in four garrisons… He will try to change his assignment for Nancy; he had news of General Fayolle… Our Identification Number: 6018811. Satisfaction Guarantee – If you are not satisfied with the autographs you can return them within 15 days without giving reasons. We do not offer any Autopen-, Secretarial-, Stamped- or Pre-Print autographs. Certificate of Authenticy – We stand 100% behind all the signatures that we offer! You will receive each autograph with a fine certificate of authenticity with a unique identification number. This service is to our knowledge unique, as illustrated certificates only bring a proof of origin in case of emergency. All prices include VAT. We are unable to accept any foreign cheques. You will receive your order securely packaged and presented neatly within a few days. Please do a google research for “brandesautographs” 2. In our autograph advice guide we will endeavour to answer the questions that we are most often asked on the subject of autographs. Now take some time to read this sections; advice that will help you to keep long and respectful you for autographs! Take a look to our Feedback and Testimonials 5. We are in business for autographs for more than 25years and maybe have Europeans largest reference library in this field. Markus Brandes is passionate in collecting autographs and manuscripts for more than 25 years and since 1997 Markus Brandes Autographs serves worldwide the needs of clients and stands for high class authentic signatures in all areas. If you have any questions or suggestions, drop us a line as we love hearing from our customers. 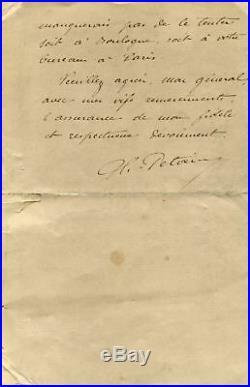 The item “Philippe Petain MARSHAL OF FRANCE autograph, handwritten letter signed” is in sale since Monday, March 5, 2018. This item is in the category “Collectibles\Autographs\Military”. The seller is “brandesautographs” and is located in Kesswil. This item can be shipped worldwide.